South of Windhoek, the capital of Namibia, we went to Solitaire to prepare for our Sossusvlei desert camp adventure. Solitaire is a small settlement that has little much to offer than a gas station, a post office and a local bar. Nonetheless it is a very common stop on the way to the sand dunes of Namibia. The Namib Desert is known for its orange coloured sand dunes, curious trees and clear blue skies. Within the desert there's the Namib-Naukluft National Park, a game reserve of the most arid kind but a true delight for the more adventurous travellers. There are a lot of strange animals and fierce animals you can encounter on your journey to to the Namib-Naukluft National Park but more than anything it is the stunning landscapes that continue to attract tourists down here. From Usakos we drove to Solitaire and entered the Namib-Naukluft National Park where we would pull up our desert camp in the Dead Vlei and the Sossusvlei. The Dead Vlei is a beautiful valley with a lot of contrasting colours, from the red dunes, to clear white sands and almost black tree branches sticking out of the ground and reflecting against the dark blue skies, not a single cloud in sight. The Dead Vlei forms a valley within the surrounding dunes, the highest in the world even, and is located near the larger Sossusvlei. Dead Vlei, or Deadvlei, is a clay pan which was formed by the Tsauchab River that flooded many years ago. Now sand dunes have taken over and the trees that grew after the flooding died tragically giving the valley its current name. While the Deadvlei is a clay pan the Sossusvlei is a salt pan, still fed by the Tsauchab River which created the Sossusvlei Canyon and feds the camelthorn trees that died in the Deadvlei. 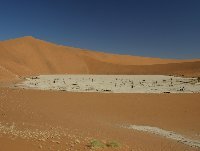 The Sossusvlei is a very touristic place, eventhough it seems to be located in the middle of nowhere and we weren't the only group setting up our desert camp here. Our stay though was fantastic and the walks over the sand dunes unforgettable! 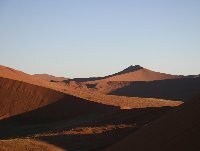 Did you enjoy Solitaire Sossusvlei desert camp and have you been on a holiday in Solitaire, Namibia?